I feel like I might be the last person in the food blogosphere to get on the bagna cauda bandwagon. 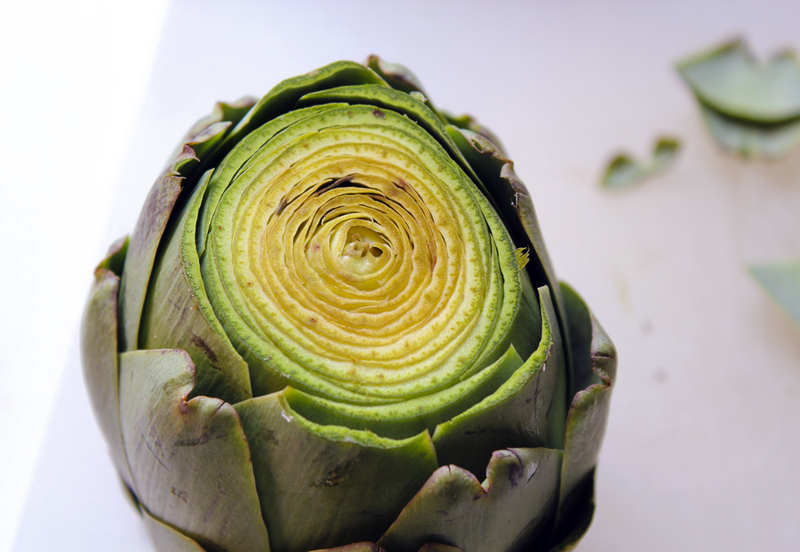 And probably the artichoke bandwagon. Not that I haven't had artichokes before, but gasp! I'd never made one. I feel like such a fraud. 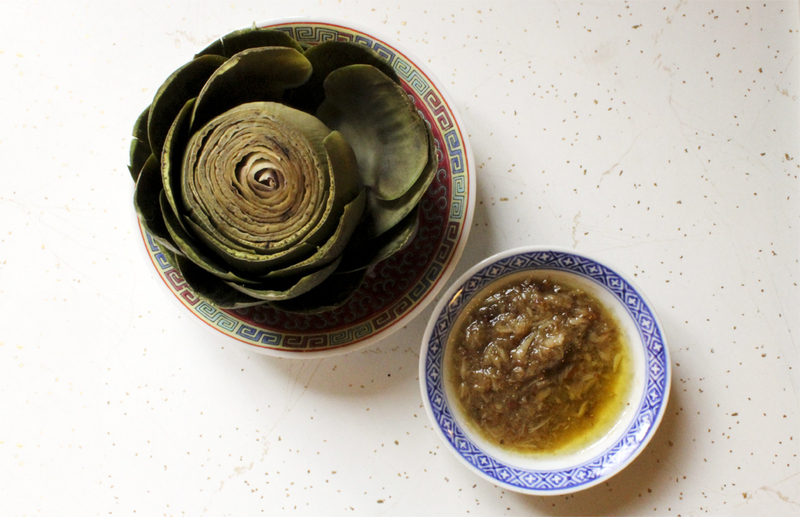 Allow me to try to redeem myself with this post, even though steaming an artichoke is like the least interesting way to make one. Sigh. GIVE ME A BREAK. I'm watching a Nova on "Why Ships Sink". Why do people go on cruises? They're disgusting. They're like my nightmare vacation. My anything nightmare. Fat people. Trashy people. Umbrella drinks. Being stuck in a hotel... because it's just a giant floating hotel. Sick. Oh honey, I have an idea for a vacation! Let's pay hundreds of dollars to go someplace where we can sit on our asses, eat mountains of food, watch movies, and be in wonderfully close quarters with other fats - hopefully ones wearing American flag shorts and bejeweled crew neck sweatshirts! Speaking of vacations, my dad has finally started talking about going to South America. I've been nagging him for years that we need to go abroad to hike/explore. There is an amazing amount of places and things to see in the US, but I'm dying to go to other countries. I've only been to Ireland and it was wonderful. I closetly dream of living there some day. So where should we go in South America? I like ruins, food, and pretty sweet mountains. Some friends of mine are thinking of visiting some ruins near some town whose name I can't remember. What if I don't come back? What if I decide to become a resident of Perú (yes I just accent marked that) and roam from village to village eating exquisite villager food and sleeping in llama pens at night? My food blog would become so wonderful! Beef heart brochettes! Gorgeous colored corn! And gorgeous colored potatoes! I'm hungry. I'm going to eat some pineapple. I guess I'm going to have to make some Peruvian food and post it. But in the meantime you can be satisfied by this garlicky, anchovy-y, salty, buttery, oily dip. 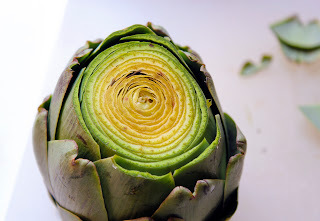 And possibly the fussiest vegetable/food item with which to dip in it. 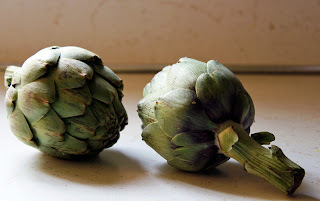 I wish I was growing artichokes in my garden this year. They're so fancy. And they're really not hard to prepare, if that's what's been keeping you from even making one. Who am I kidding, you've probably been making them since you learned to cook and you're rolling your eyes at my novice exultancy. Bare with me here. And I'd love to hear any tips or suggestions. Steaming them was super simple, obviously, and with a generous amount of lemon juice squeezed on afterward, they won't turn brown (and taste freaking awesome with it, too). Bagna cauda is one of those tricky ethnic recipes - like, I'm sure everyone has their own particular way to make it and there may or may not be a best way to make it. 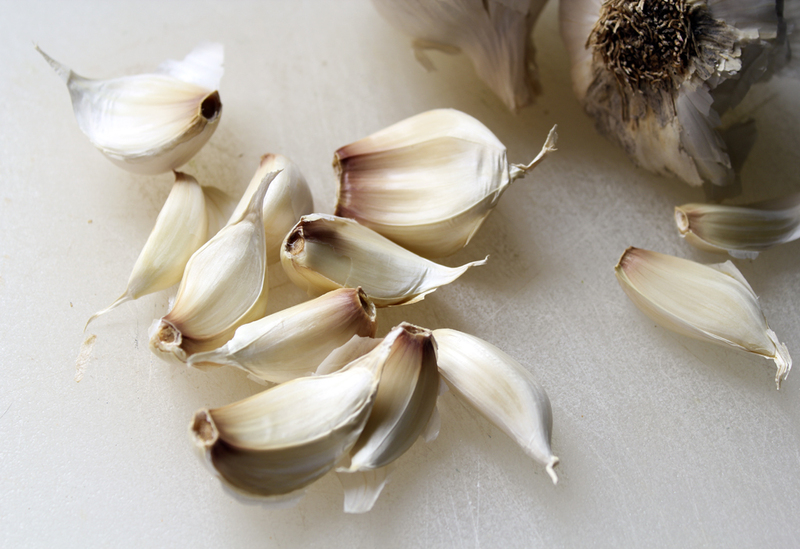 It uses a lot of garlic. Three entire heads. I was torn between boiling the cloves, like I did, or simply simmering minced ones in the oil and butter until they'd mellowed. I'll do the latter next time to try it out, but boiling them first is super easy and avoids any garlic sticking to the bottom of the saucepan. 1. 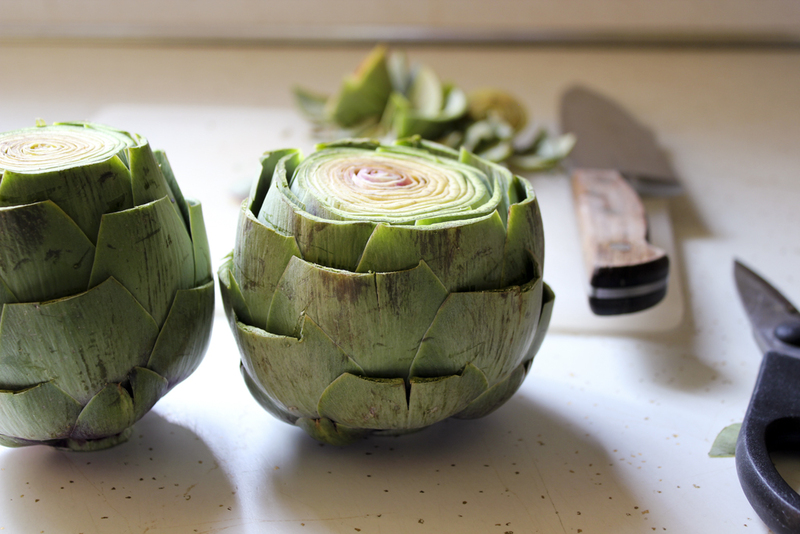 To prepare the artichokes, cut off the top 1/2 inch or so of the whole artichoke. With kitchen scissors, trim the tip off of each leaf. Done! Easy! 2. Bring a large pot of salted water to boil, then add the artichokes. 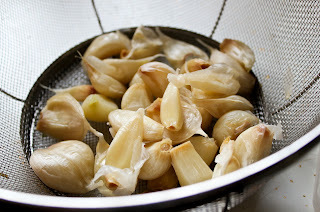 Boil for about 30 - 40 minutes, until they are tender and the outer leaves come right off. 3. 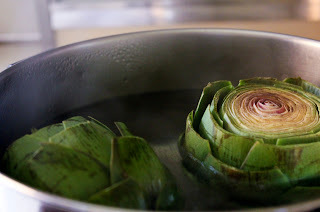 Meanwhile, while the artichokes are boiling away, bring a small saucepan of water to boil and add the garlic cloves, boiling for about 20 minutes. 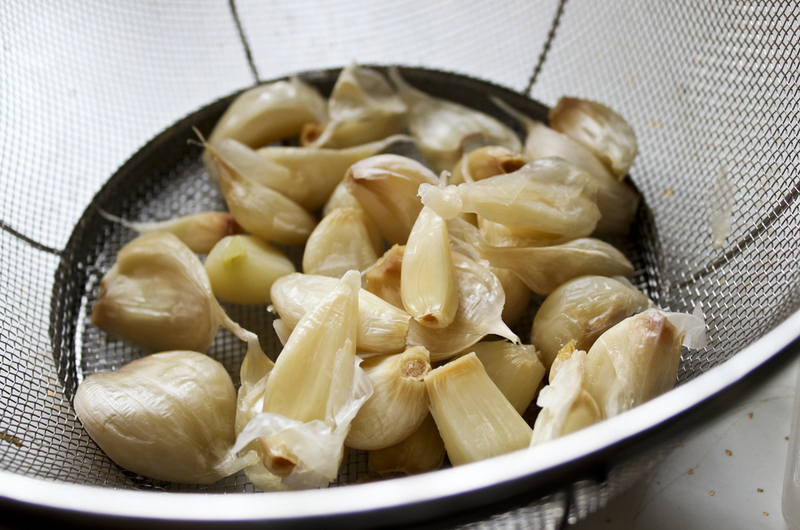 Drain them and when they're cool enough to handle, squeeze out the garlic from their skin into a bowl. Mash into a paste. 4. Rinse out that saucepan, add butter and heat over medium. 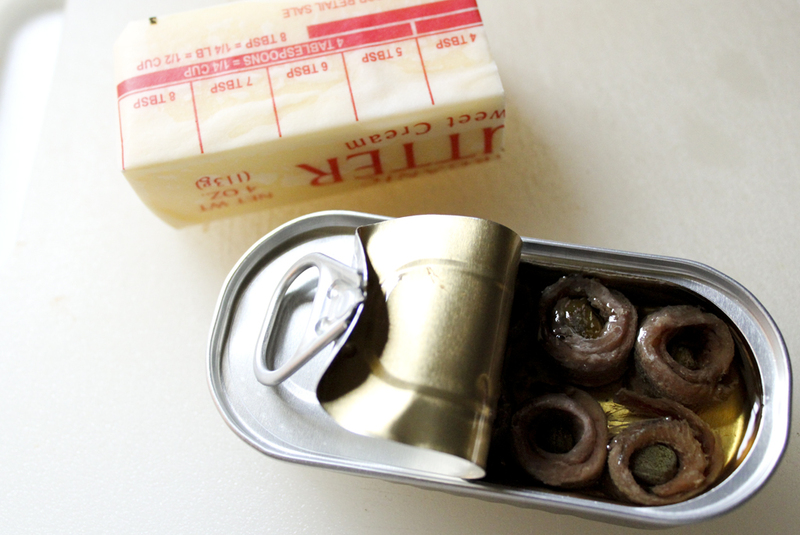 Add anchovies and mash around a bit. Then add garlic and olive oil. Stir occasionally and simmer over low heat for about 10 minutes. Season to taste with pepper. 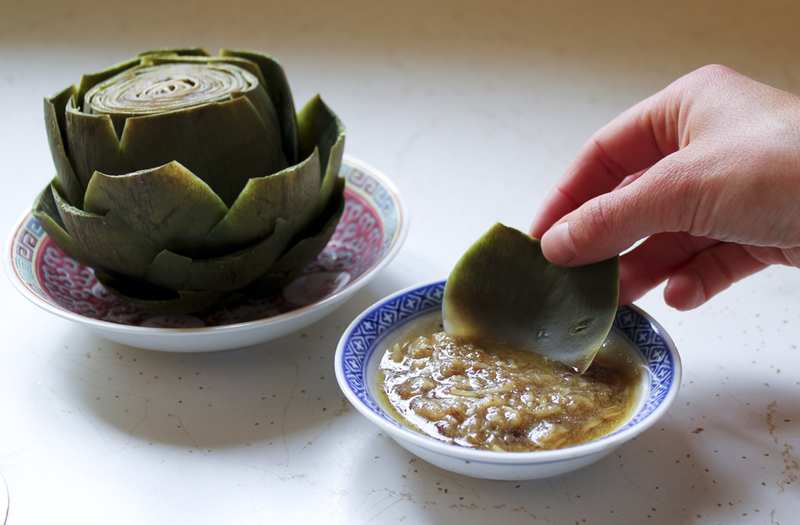 Dip the base of the artichoke leaves in the hot bagna cauda and don't make yourself sick from eating too much.